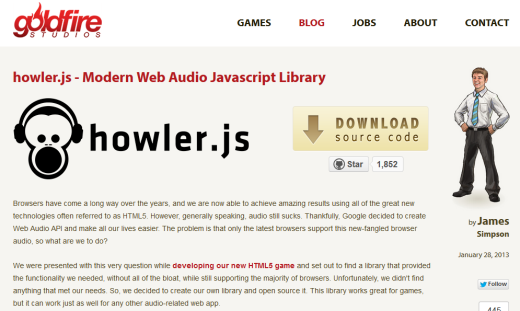 For this post, I’m going to cover a library I’ve used in the past and generally recommend: Howler.js. It has good testing for the majority of file formats most platforms use and presents a simple interface for doing basic audio tasks. Multiple files will be needed. Unlike image files, which can now be easily linked to and used with Twine 1.4, sound files are potentially much larger and also require hosting from some location. They will need to be uploaded and stored in the same folder structure as assumed by the code. Multiple formats will be needed. Because of the licensing issues surrounding formats like OGG and MP3, it is best to have at least three versions (WAV, MP3, and OGG) of every sound you want played for desktop browsers. For mobile users, I highly recommend adding M4A to the list too. Be careful about copyright. Make sure, if this Twine project is going to be public, that you own or otherwise have the rights to use the audio in question. It’s not worth the problems that come from ignoring this, believe me. And there are numerous Creative Commons licensed tracks from places like SoundCloud to choose from as well. The first step will be to create a new Story in Twine. Do that now. Then, go ahead and save it in a known location (as we will be using its folder in just a moment). Next, we will need to get the Howler.js code itself. 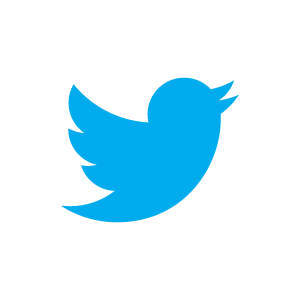 For that, visit here. 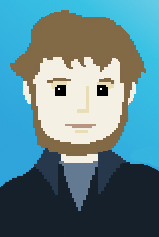 Follow the link to the GitHub source. On the right hand side, there will be a link to “Download ZIP.” Do that. Once the download is complete, extract the files. Copy the “howler.min.js” source to the folder where you saved the Twine file. Within Twine, create two Script passages. In the second, copy this next above code. It is the macro that will be called whenever a sound should be played. It creates a single instance of a Howler object, with the sources passed to it from the calling passage, and once it loads one of the files, plays it immediately. To actually use all this code, we need to make sure the following condition is met: the “loadJS” macro, with the argument to load the Howler.js library, MUST be called before the “playAudio” macro. So, one method might be to create a passage with a single line that calls the “loadJS” macro. Then, within the Start passage, have the “display” macro call this other passage. Finally, to play a sound file in another passage, we simply call the “playAudio” macro with the parameters of the file and its associated different formats. Howler.js will load the first supported type and play the file. I show one of the most basic ways to play audio files here. 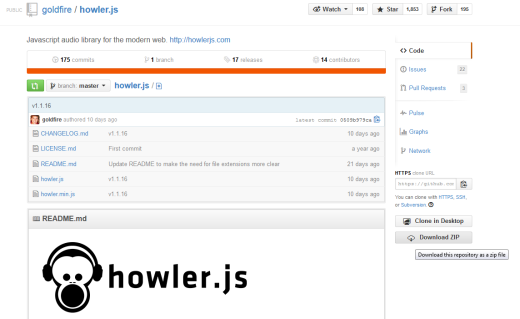 Consider, if you want more options, investigating the Howler.js site or even the code itself on GitHub. There are ways to have Howler objects chained together or play as a result of other actions. If you have many short sounds, consider making an audio sprite instead. Howler.js has the ability to play from and to a preset place within an audio file. This can be used to group sounds together as one download instead of even more files.